We spent 28 hours researching and testing 10 different kinds of drill bit sets and found that quality of materials, bit design, and durability were most important. The Irwin drill bit set scored above all the other drill bit sets we tested in all categories and is our top pick. It is the perfect drill bit set for drilling into wood and plastic and is suited for residential or commercial use. These drill bits start on contact, producing cleaner drilled holes. There are 29 pieces in this set to allow for plenty of flexibility. There is a convenient carry case as well. Unless you regularly use drills and know some things about them, you may not know that there are many different types of drill bits that you can get for a regular corded or cordless drill. Having a good set of drill bits can provide a lot of variety in the jobs and projects you can do. Sorting through all of the choices available can be overwhelming for anyone who isn’t a professional. We have provided this guide as well as reviews of three of the top rated drill bit sets that you can get for your drill. This guide will help you understand what makes one set of drill bits better than another and how to decide which ones you should look at for your own needs. After reading this guide, you will understand the different types of drill bits available plus you will know about the different materials that are used and how to choose the right set for your specific needs and projects. With so many choices available and so many different types, having this information will help steer you toward the perfect drill set for your needs. 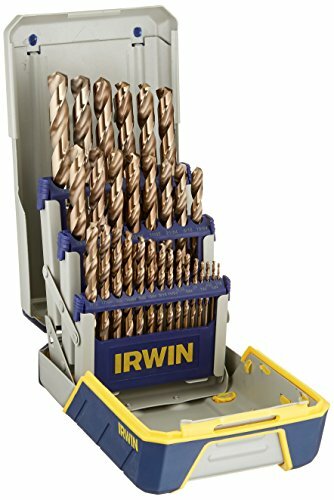 IRWIN tools provides DIYers and professionals with this exceptional cobalt, high-speed drill bit set that can used for a multitude of projects around the shop, home and worksite. There are 29 pieces in this high quality set that range from 1/16th in. to ½” and goes up 1/64th an inch for each size in between. They are made from high-speed industrial strength steel so they are much stronger and last a long time. The 8% cobalt is both abrasion resistant and heat resistant as well. The point tips feature 135 degree split that allows for immediate drilling and requires much less force. “Walking” across the project surface is eliminated thanks to the quality construction and materials used in these drill bits. Choosing the right bit for your project from the bits offered is made easy thanks to the over molded rubber case that is marked for easy selection. The sturdy, protective case prevents damage from being dropped so you know your drill bits are safe. If you’re looking for an excellent, high quality drill bit set that is perfect for on the job site as well as in your garage, look no further than this Cobalt Drill Bit Set from IRWIN. Bosch is another well known and trusted brand in power tools. This 91 piece drilling and driving set takes care of all of your drilling needs. It has a ratcheting screwdriver along with the bits that provide the user with plenty of variety for projects involving metal as well as wood. There are also nut setters in this case for additional project work so not only do you get a set of excellent drill bits you get other general purpose accessories as well. There are several different types of drill bits in this set including Brad Point, rotary masonry bits and titanium bits too for a full range of choices that will fit every need. 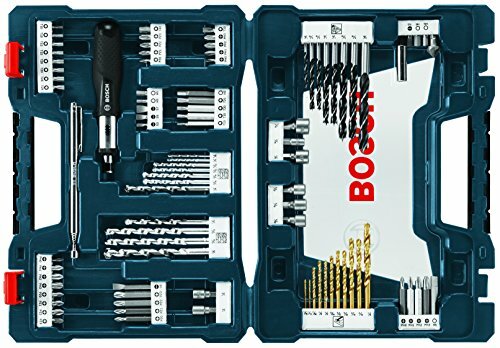 Bosch provides professionals and DIY-ers with a drill bit set that goes above and beyond in durability, quality and variety as well. Everything comes in a jobsite ready case that makes carrying them around easy. 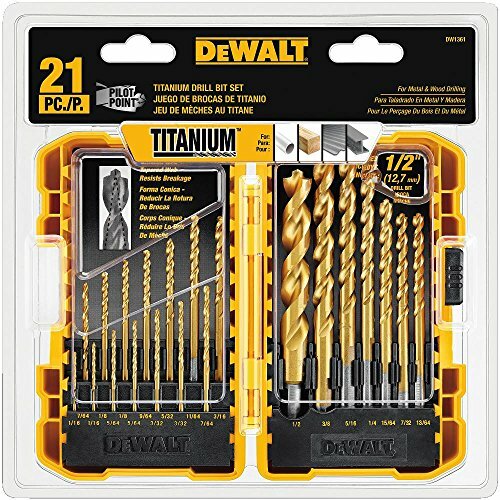 DEWALT is a well known name in power tools so the fact that this titanium pilot point drill bit set is in the top three is not surprising at all. The titanium coating that these drill bits have provides users with a longer bit life than other types can have. This drill bit set is great for drilling into plastic and wood and can be used in both commercial and residential projects. There are no spin shanks and the web is tapered for much greater durability which means less drill bit breakage. These bits start on contact so the drilled holes are much cleaner as well. There are 21 pieces in this set to provide plenty of flexibility when choosing bits for your projects. Users can choose from 1/16th “ to ½” drill bit sizes and it all comes in a durable and convenient plastic case for easy carrying. Drills are a common power tool that almost every home has where DIY projects are done. They are also in every garage and commercial work site as well. Having a set of high quality drill bits is a must. Most professionals have more than one set but if you are a DIYer that does regular repairs and projects around the home or garage, one high quality drill bit set will more than likely be all you need unless you get into specialty work. The three drill bit sets featured above have everything you need to tackle multiple projects and repairs with ease. The drill bits are made from high quality materials that are made to last and perform at optimum levels. They come in convenient protective cases that make it easy to always have the drill bit you need handy and ready to grab. Choosing the right set of drill bits requires some knowledge of what is out there and how to determine a set of quality versus a set that should be passed over. The buyer’s guide below will give you some valuable information and tips on how to choose the perfect set of drill bits for all your drilling needs. There are many different types of materials that are used to make drill bits. We have listed the different types of materials below and a little about what they are suited for. Steel – Steel drill bits are some of the most inexpensive types of drill bits available but when used to drill into hardwood or harder materials they can dull very quickly. They are terrific for drilling holes into softwoods. High Speed – High speed bits stay sharp for a lot longer than plain steel bits. They are also harder than steel and are excellent for general purpose drilling projects. Black Oxide – Going on up the hardness and durability ladder is black oxide drill bits. These are two times more durable than high speed drill bits and are also used for many different applications. Titanium – Titanium drill bits are very popular and are more durable than both steel and high speed drill bits. Titanium coated – these drill bits are as much as six times more durable than high speed bits. They are more expensive and feature reduced friction for cooler drilling which is a plus. Carbide Tipped – These durable and long lasting drill bits are harder than titanium, steel and high speed bits and make excellent drill bits for a number of different applications. Zirconium coated – users will find that these drill bits provide much less friction and improved durability along with a smooth finish that is very hard. Cobalt – Cobalt drill bits are high quality bits that get rid of friction from drilling quickly. They are extremely hard and can be used to drill into stainless steel as well as other metals. They are long lasting and durable as well. Now that you understand about drill bit materials, we will provide information about the different types of drill bits that are available. It helps to understand what you want to do with your drill and how often it will be used. Those determining factors help users choose the bits that will be able to stand up to the demands they place on them. With so many different types of drill bits on the market, it is beneficial to the driller to choose a variety of bits that can work with many different materials. If you work heavily with one specific type of material such as metal or wood, it would be a lot better for your project outcomes to choose a couple of different types of drill bits. We have listed the different types of drill bits below. There is a lot more to finding the right set of drill bits than one might realize. If you have a lot of experience using drills you are already familiar with the large array of choices available. If you are relatively new to the drilling world, it can be really overwhelming when you see just how many different kinds, sizes, types, materials and applications that are available when it comes to drill bits. Drill bits are designed for drilling into metals, woods, plastics and many other materials including concrete. Having the right drill bits for the project you are working on prevents you from breaking the drill bits you are using (if you are using an incorrect type for the project) and helps the drilling process go much smoother. Drill bits can be purchased separately or in sets like the three featured drill bit sets above. Most drillers will buy at least one good quality set of drill bits and then if they need specialty bits they can purchase those as the projects dictate. If you routinely work with different materials such as wood, metal and plastics, you may want to consider purchasing a couple of different drill bit sets that will work the best with the different materials you work with. It will make the drilling process much simpler, smoother and more enjoyable when you have exactly the right drill bit for what you are working on.